The highly infectious 'bubblegum' punk of Calva Louise looks set to remain at the forefront of new and exciting guitar music as the trio's popularity continues to increase in the UK and further afield. 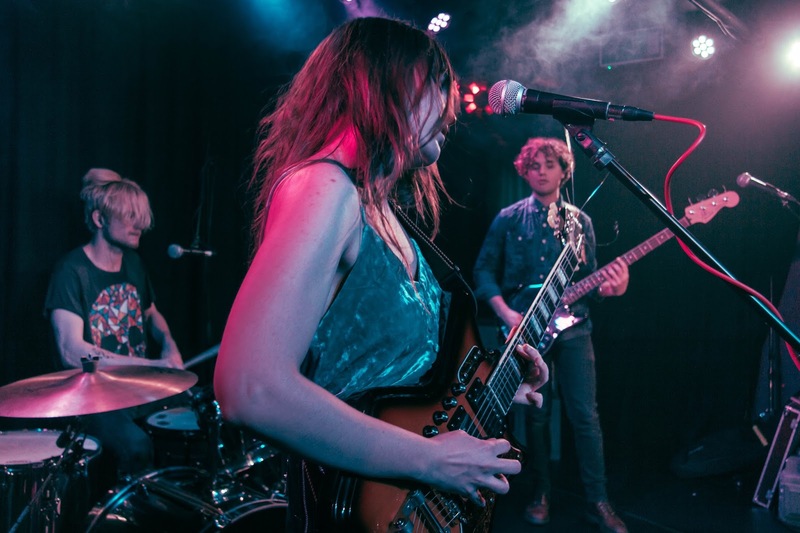 Cool fuzzy guitar sounds and what appears to resemble the sound of an organ created on a guitar by using an octave effect, heavy grohlesque style drumming and Blondie/The B52s inspired vocals are some of the original ingredients in Calva Louise's music. Working absolute wonders also is the unique trademark of strong pop harmonies mixed in with punk. 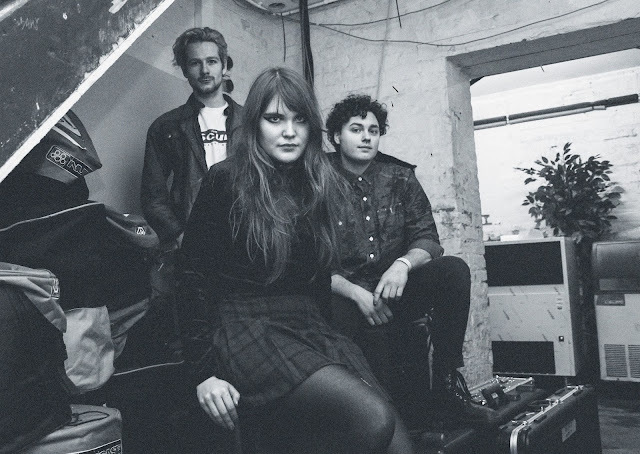 Formed in August 2016, guitarist and vocalist extraordinaire Jess Eastwood, drummer Ben Parker and bassist Alizon Taho, collectively known as Calva Louise, are an imaginative, super-creative group of young musicians who work around north London. Working hard, rehearsing and writing music most days of the week, the trio plays a vital part in the community of bands and production talent closely associated with record company Modern Sky UK, one of the most innovative and influential record labels in the industry just now. Following the successful completion of their recent headline tour around the UK, It's All Indie met the trio to talk about what they are up, new material and lyrics, how they like to work and their collaborators. You have been gigging a lot around the UK, do you see an increase in audience numbers and/or different people at your shows? Jess: Sometimes we will play a gig and a few people come up after the show saying stuff like 'I like you guys and I’m definitely coming back', that has happened quite a lot and we have seen the same people at shows, it is something we really appreciate and we are like 'yeah he came back’. When they bring their friends and stuff that is even better and is great for us. Experiencing that must be rewarding. There is a lot of interest in Calva Louise right now and how do you see things? Jess: We don’t really see things from an external perspective. If we started to pay attention to that we could derail and stop focusing on what we are doing. So in a way it feels like nothing is actually moving much because we just keep following the same process, just pushing a little bit harder. We write every day and try and take things further. A sense of progress and focus is important to us. Ben: We are really just seeing the next few footsteps in front us as opposed to looking over the horizon. It is one step at a time for us. The band rehearse and write daily in Finsbury Park at Hermitage Works Studios. Their producer is Margo Broom, whom they refer to as their 'mother' and one of the 'nicest, most humble and amazing people we know'. How did you come across Margo Broom? Alizon: We were doing some sessions and were invited to be part of one with her so that is how we got to became familiar with Hermitage Studio Works and met Margo. Jess: When Margo met our manager Stephen Kempner they got along super well straight away. Stephen also works with Catholic Action and Margo records them too, so it is all part of the same sort of circle. Jess: The label is full of really good people, everyone there knows each other. It feels like we have arrived into a very kind and welcoming family. Everyone there trusts one and another and we share things. Some other really great bands are signed to the label and being with people who love music is great. Jess: We really want to show that we deserve it and we are not going to mess it up. At first when we got offered the deal we were like ‘We don’t have the songs’ and everyone around us was like ‘yes you do, make it work’. You will be releasing your debut album later this year. Have you recorded the material for it? Ben: We have written a bunch a songs for it, we are putting them to record and then it is the process of releasing it which we will figure it out along the way. Alizon: It is great that we have finally got a chance to do what we like, continue the work and being able to take things a little further. What can you tell me about the material for your debut? Jess: Some songs we have been working on for years. Things are really picking up now and clicking, I get why it was not working as well before. Some of the material is new, some songs came really quickly and other songs needed years, it varies a lot. Now it is more like let's give it rest, try not to get obsessed, stay clear and be pragmatic. We know each other so well now and things work even better, there is more fluidity. Is it fair to say identity and conflict are recurring lyrical topics? Jess: Our album is mostly about the process of becoming an adult, not just any adult, not just accepting it as it is. Accept the fact that you changing and influence what you can change. We are all taking a risk in life. But if you are going to risk it all for something, it is better to do something you really believe in, do something that is good for you. But people who are doing jobs they don’t like are also risking their lives. Jess: It is important to describe abstract feelings. I think a singer like Julian Casablancas does that really well. For example in order to describe a conflict, you need a story and that is really important because people need to be able to follow what you are saying. In a way there are no rules, there is no formula and that makes it much harder to do well. Jess: It is about the conflict of having two minds so to speak, one mind that keeps you going and the other makes you stop or doubt things. There is also the thing about growing up, becoming an adult and that is when it gets harder. As a kid you don’t really think of the long term future at all. When I grew up it is like there was no turning back, you were faced with the now or never, I have to be who I want to be. Most of our lyrics revolve around that. Jess: Calva means 'bald' and Louise was chosen by Alison, who liked the name. But we had so much absurd stuff happening to the band. Then there is this play called The Bald Soprano by Romanian and French playwright Eugene Ionesco. I studied him at school and saw the play in Spanish, it was the most absurd thing but also very funny. life can be like that too, it can be absurd and funny. We feel it almost acts like a metaphor for what we went through as a band. Alizon: We all come from different countries (France, Venezuela, New Zealand and Britain). In speech sometimes, I might say something and someone else in the band will be like, what do you mean by that? In French and English things translate differently, so to an extent, there will always a comedic dialogue between us, because I understand something when I say it, another band member understands something completely different, so we have this absurd dialogue but not as much as we used to of course. Ben: Yes it was interesting because when we first met it was like we had all these different mother tongues like Spanish, french and English so yeah things just got a bit confused at times. Do you enjoy recording and working in the studio? Ben: Yes definitely, working in the studio with Margo where we rehearse as well as record is great. There is just a good vibe, people will like come and go there while a recording is happening but it is nice just to say hi to everyone and it is just really relaxed. Strange Cages record there as well, they are a great band. 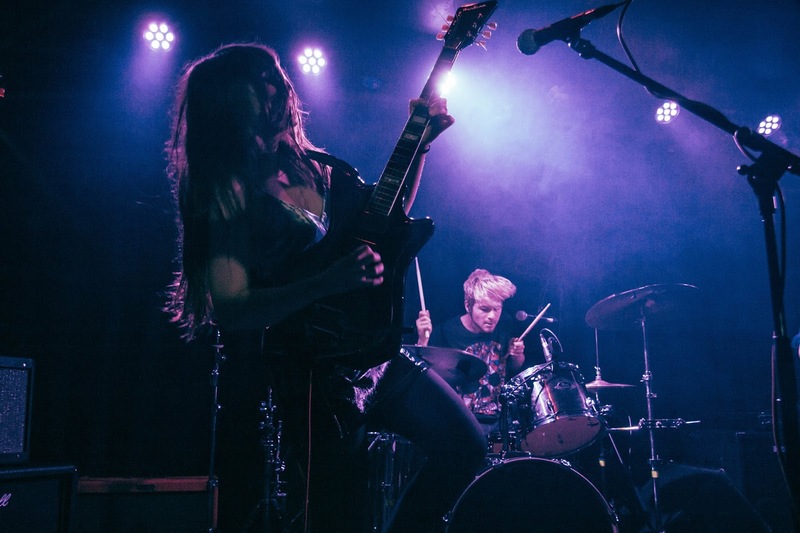 That sounds inspirational and Calva Louise are on a really good run but what are you still looking to achieve as a band? Jess: Our main goal probably has to be to write as many songs as possible and keep our focus. We work every day and we don’t really tend to have much of a rest. Of course, we rest our bodies when we need to be but we are excited about what we do and enjoy it. Our attitude is like ‘yes, let’s go and do it! Sometimes, our bodies need sleep you know but we are not like 'we can’t be bothered' and being in this band definitely keeps us going you know. Alizon: We also want to continue to play live shows and touring. It is great when people start noticing then we feel that some of our hard work is paying off.